In 1964, Italian filmmaker Pier Paolo Pasolini released a film titled, “Il Vangelo Secondo Matteo,” which is translated, “The Gospel According to Matthew,” or as it was titled upon release, “The Gospel According to St. Matthew.” The film followed the life of Jesus Christ, exactly as the story told it in the Matthew’s account. 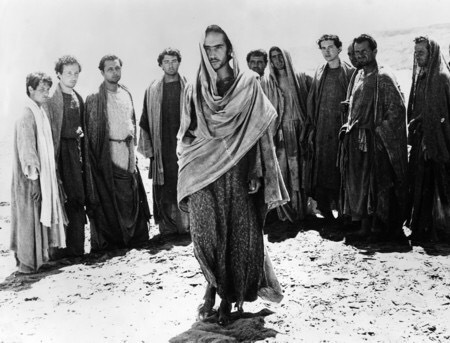 In fact, the script for the film is almost word for word with the text recorded in Matthew’s gospel, and where the written account was silent, the film was also silent. The result was a film so meditative and authentic, that it remains to be one of the most faithful screen adaptations of the life of Jesus as recorded in the gospels that has ever been made. Contrary to many other such films on Jesus, which often portray him as a beautiful, clean, and eye-catching figure, Pasolini’s film portrays Jesus as, physically speaking, an average, unremarkable individual. Truthfully, due to the fact that the actor portraying Jesus looks so much like many of the actors around him, there are times when he blends in with the crowd and is difficult to distinguish. It’s clearly not because of appearance that people follow him—it’s because of his teachings. In the film, Jesus is played by Enrique Irazoqui, who at the time wasn’t an actor but a Spanish economics student. His performance in the film is very subdued. Rather than bringing the typical charisma that most others have brought when portraying Jesus on screen, he instead brought a quiet, subtle take. There is nothing showy about his performance—everything in the film is very stripped-down. The portrayal of Jesus in the film is very much a reflection on the nature of Pasolini’s interpretation of the story and the character. You see, Pasolini wasn’t what most people might consider a fitting filmmaker for a film on the life of Jesus. He wasn’t a Christian—he was an atheist, a Marxist, and a homosexual, and he was notorious for being outspoken on all of those topics. And yet, his film is remarkably faithful to the text of Scripture. As I mentioned, he took virtually no creative license in reworking the script—every line of dialogue in the film can be found in Scripture. Watching the film makes me wonder something: How do our beliefs in Jesus shape the way that we think about him? At its core, art, particularly visual art, is an interpretation of something, whether that be something in the physical world or something in the artist’s own mind. This is, perhaps, mostly clearly seen in self-portraits. When an artist sits down to paint a self-portrait, they are not painting what is actually there in the mirror—they’re painting what they see, or better yet, what they think they see. In essence, they are describing with a paint brush not what they actually look like, but what they think they look like. Take a look at artwork centering on Jesus, and pretty soon, you’ll start to see patterns emerging. More often than not, artists paint him with not only long hair, but was beautiful, flowing hair. His face is always vibrant and full of compassion, and his robes are always clean and perfectly white. In one children’s book, I even saw an illustration of Jesus holding a kitten. It’s not surprising why more often than not, artists who are believers seem to portray Jesus as being physically beautiful. After all, he is reason for our hope, the author and perfecter of our faith. It seems natural to think of him in this way. And yet, this kind of thinking often seeps its way into our beliefs. We create an ideal Jesus—one who looks the way we want him to and says the things we want him to. We think that our idea of who Jesus is makes him more approachable or palatable to others, but in so doing, we exclude others who don’t see him that way. One person views Jesus only in the moment when he turned over the tables of the money-changers in the temple, and another person always pictures him with a kitten in one hand.